Home DIY Cooking On A Budget Cooking On A Budget: Memorial Day Flag Taco Salad! 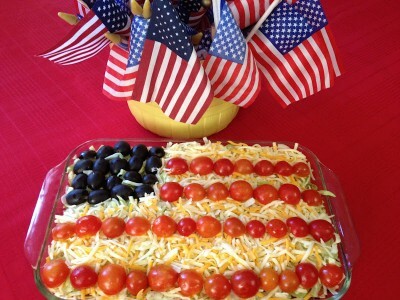 Cooking On A Budget: Memorial Day Flag Taco Salad! Memorial Day weekend 2016 is here! Do you have any special plans for the weekend? For most people in the United States, this weekend is spent outside (if the weather permits) enjoying the sunshine and feasting on delicious cookout foods. Of course, family and friends also gather together to celebrate this first unofficial summer holiday. There are so many different tasty foods you can make if you are hosting a Memorial Day celebration or a contirbuting to a potluck. Today, we are sharing a super simple, inexpensive, and totally festive recipe for a Memorial Day taco salad flag! Yum! Cook the ground beef in a large skillet over medium heat. Cook the beef until it has turned light brown and appears to be cooked through. If there is excess grease from the beef, drain that. Then, add the taco seasoning, water, and salsa. Simmer the mixture for approximately 1 minutes. Keep the skillet uncovered as the mixture cooks. Most of the liquid should have cooked off. In a 13×9″ pan, place the tortilla chips in an even layer (if you are serving the dish right away!) If you are not serving the dish immediately, skip this step and serve the tortillas in a bowl . Then, evenly spread the beef mixture over the cups. Spread a layer of shredded lettuce over the chips and beef. In he upper left hand corner, add the sliced olives to create the stars on the flag. Then, create you flag stripes by using the cherry tomatoes and creating straight and even rows with them. In between the rows of tomatoes add your shredded cheese. Then, dig in!